26 m a s s a g e & b o d y w o r k n o v e m b e r / d e c e m b e r 2 0 1 8 BLUEPRINT FOR SUCCESS best practices Is Your Business Serving You? 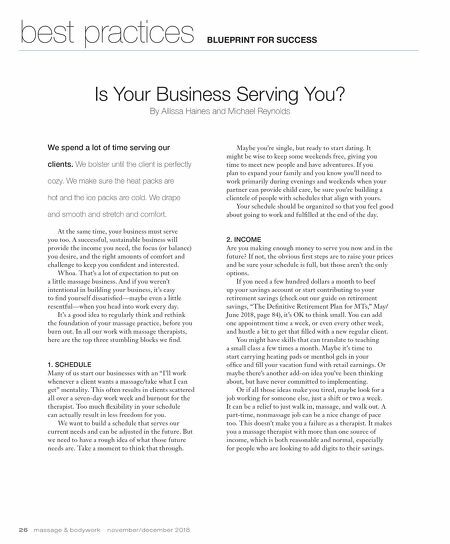 By Allissa Haines and Michael Reynolds We spend a lot of time serving our clients. We bolster until the client is perfectly cozy. We make sure the heat packs are hot and the ice packs are cold. We drape and smooth and stretch and comfort. At the same time, your business must serve you too. A successful, sustainable business will provide the income you need, the focus (or balance) you desire, and the right amounts of comfort and challenge to keep you confident and interested. Whoa. That's a lot of expectation to put on a little massage business. And if you weren't intentional in building your business, it's easy to find yourself dissatisfied—maybe even a little resentful—when you head into work every day. It's a good idea to regularly think and rethink the foundation of your massage practice, before you burn out. In all our work with massage therapists, here are the top three stumbling blocks we find. 1. SCHEDULE Many of us start our businesses with an "I'll work whenever a client wants a massage/take what I can get" mentality. This often results in clients scattered all over a seven-day work week and burnout for the therapist. Too much flexibility in your schedule can actually result in less freedom for you. We want to build a schedule that serves our current needs and can be adjusted in the future. But we need to have a rough idea of what those future needs are. Take a moment to think that through. Maybe you're single, but ready to start dating. It might be wise to keep some weekends free, giving you time to meet new people and have adventures. If you plan to expand your family and you know you'll need to work primarily during evenings and weekends when your partner can provide child care, be sure you're building a clientele of people with schedules that align with yours. Your schedule should be organized so that you feel good about going to work and fulfilled at the end of the day. 2. INCOME Are you making enough money to serve you now and in the future? If not, the obvious first steps are to raise your prices and be sure your schedule is full, but those aren't the only options. If you need a few hundred dollars a month to beef up your savings account or start contributing to your retirement savings (check out our guide on retirement savings, "The Definitive Retirement Plan for MTs," May/ June 2018, page 84), it's OK to think small. You can add one appointment time a week, or even every other week, and hustle a bit to get that filled with a new regular client. You might have skills that can translate to teaching a small class a few times a month. Maybe it's time to start carrying heating pads or menthol gels in your office and fill your vacation fund with retail earnings. Or maybe there's another add-on idea you've been thinking about, but have never committed to implementing. Or if all those ideas make you tired, maybe look for a job working for someone else, just a shift or two a week. It can be a relief to just walk in, massage, and walk out. A part-time, nonmassage job can be a nice change of pace too. This doesn't make you a failure as a therapist. 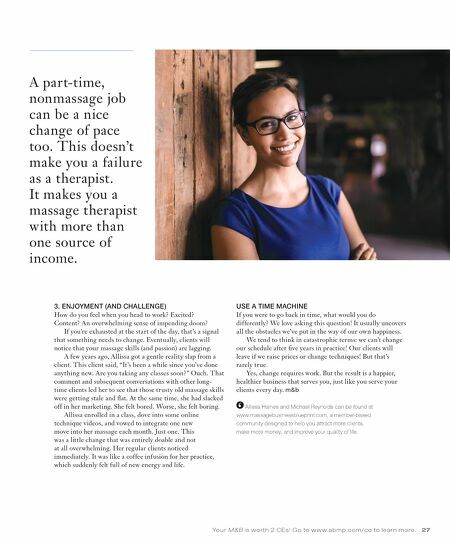 It makes you a massage therapist with more than one source of income, which is both reasonable and normal, especially for people who are looking to add digits to their savings.